hosted this one-of-a-kind prestigious event that surpassed every guest’s expectations. RANCHO SANTA FE, CA — The Valenti Foundation’s spectacular inaugural black tie gala to benefit abused, homeless and foster children in San Diego County held on April 12, 2008, was a huge success. At $1,000 per seat, it was a sold-out event. Truly a night to remember, it was one of the best organized and smoothly run black tie affairs held in memory according to many of those attending. Valenti International opened its doors to the public for the first time in its history to benefit needy children in the County. The evening began welcoming guests into the Grand Foyer of the Valenti International Headquarters along a true red carpet entry. Rich red suede drapes, silver urns overflowing with matching red roses, and a gauntlet of greeters with champagne on silver trays signaled that this night would be something special – the likes of which San Diego has not seen. Valentino Red punctuated the sleek stark black and white framework of the 8000 square foot tent. White suede linens adorned the king’s tables set atop a custom hi-shine black composite appliqué floor. White duponi silk draped the walls and ceiling, and black hi-gloss chavaris chairs adorned the grand tables. Seven by fourteen foot mirrors with a frame of solid red roses flanked the guest tables coordinating with the lush centerpieces that ran the length of the tables. These decadent centerpieces rested in black mirrored troughs which complemented the unique floor below – thus tying the venue together into one sinuous, elegant environment. The décor focal point of the night, however, consisted of an installation of Valentino’s 45 years of fashion highlighted on Swarovski crystal mannequins interspersed with vitrines set with millions of dollars worth of Damaini Jewelry. It was difficult to believe that this was a tent, more so, it was a Grand Ballroom custom built for this one night as the millions of crystals, diamonds, and other fine jewels cast sparkles of light throughout. The program of the evening was as stellar as the décor, and left no eye dry, no pocket full, and, at the end of the night when the legendary Chubby Checker took the stage, no seat occupied! 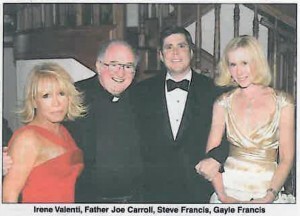 The night began with the guest of honor – and the reason that this once in a lifetime event took place – Father Joe Carroll’s message of giving children a sense of purpose, character, dignity and values – all to be found through the development of “A Children’s Village”. His incredible impact on the community, tied in with the host of the night, Irene Valenti’s passion for helping the youth and the elderly, left no one questioning why they were there. It was very evident throughout all aspects of the entire night that both Father Joe and Valenti International are passionate about this cause. San Diego City Councilmember Brian Maienschein was also on hand to present Irene Valenti, the founder of Valenti International and The Valenti International Foundation with a Special Commendation for supporting Father Joe’s Children’s Village. The 501(c) 3, non-profit organization is still tabulating the total for the evening as donations continue to pour in, raising money for “A Children’s Village” (Father Joe’s Villages) in San Diego’s East County, which will be home for more than 200 children who have no home. A Children’s Village is being made possible through the generous gift of 120 acres of scenic land 50 miles east of San Diego by the Stephen and Mary Birch Foundation. It will be located at the Flying A Ranch –- a pastoral setting surrounded by rolling hills and sweeping mountain views– in beautiful San Diego County. Currently under development, the ranch will serve as home to 200 children who are no longer able to live at home. It is a place where neglected children can discover a world of sunrises and have room to play, as well as the receive the guidance and caring they need to flourish. The Youth Camp & Retreat Center, located on 120 acres in scenic eastern San Diego County, will provide youth a much-needed opportunity to experience the great outdoors. The camp will offer rope climbing courses, horseback riding, hiking, rock climbing, swimming, volleyball and basketball courts, soccer fields, an archery range and more. This working ranch will help youngsters build confidence, encourage teamwork and build an appreciation for nature’s beauty.